In this age of rapid technological progression and heightened competition, designers of interactive systems, especially web applications, must be able to prepare for, cope with, and adopt to design processes that meet both customer needs and expectations and cutting edge-technology. 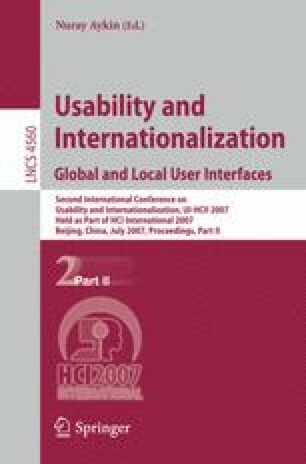 This paper presents the authors’ experience with designing and prototyping a web application using a new web user interface (UI) development technology. We describe how the technological progression forced significant changes in User-Centered Design (UCD) process and design tools. We then discuss the contributions of these changes to the design and development of an internationalized web application. We provide background information about an Abstract UI and the web implementation using JavaServer Faces (JSF) technology. We describe how this new technology will be adopted into CA’s UCD process and present a case study in which the new JSF technology solution is used for a prototype of an enterprise storage management application. We then discuss the pros and cons of using this technology at the design stage, providing some structure and guidance to designers who might be faced with similar situations. This paper suggests there may be a more appropriate alternative to the current design processes and tools used for designing web applications.